Mass. advocates vow to fight against over-broad 'public charge' definition, which would deny green cards to people who access key safety net programs - or whose jobs don't pay high enough wages. Health Care For All (HCFA) announced today it received two grants from the MetroWest Health Foundation (MWHF) to improve access to health insurance and health care among residents in the Metrowest region. Answers to Your Democracy School Questions, updates on Public Charge, and it's time to take Action for Safe Communities! Take Action for HCFA FY19 Budget Amendments: Let Your Voice Be Heard NOW! (Boston, MA) – Today Governor Charlie Baker signed into law important legislation that advances patient confidentiality. An Act to Protect Access to Confidential Healthcare (PATCH Act) (S. 2296) ensures that when multiple people are on the same insurance plan, confidential health care information is not shared with anyone other than the patient. The time has come to support Dental Therapist legislation in Massachusetts. We hope that you feel as strongly about this issue as we do. To find out more information about Dental Therapists, click here. (Boston, MA) - The Dental Care for Mass Coalition, which supports legislation to authorize dental therapists (S. 1169/H. 2474), announced today that Associated Industries of Massachusetts (AIM), Blue Cross Blue Shield of Massachusetts and a number of other key organizations have joined the more than 60 organizations fighting for increased access to oral health. Reports are due by October 1, 2017. We provide a template to help PFACs more easily gather infromation and send their reports. Amy Rosenthal brings over two decades of legislative, policy and advocacy experience to the organization at a critical time for the health care advocacy movement. During an event at Old South Church, workers, consumers and advocates lay out the risks to Massachusetts if Congressional Republicans move forward with their healthcare replacement bill. BOSTON -- “Health Care For All (HCFA) understands the need to balance the state budget to address tight tax revenues. However, we believe strongly that those cuts should not be made on the backs of those most vulnerable. Health Care For All appreciates the work of Senate Ways and Means Chair Karen Spilka and Senate President Stan Rosenberg on proposing a thoughtful budget that focuses on directing funding to key programs for our communities. Health Care For All Celebrates Its Annual Event Turning Fundraising Galas Upside-down! "Health Care For All appreciates Governor Baker's budget proposal that preserves and invests in many critical health-related programs. Framingham – State legislators, town officials, and health care advocates joined Health Care For All (HCFA) in Framingham today to urge MetroWest residents – and in particular, those who are traditionally under-enrolled and under-insured – to enroll or reenroll before the January 31st end to this Open Enrollment period. BOSTON - Researchers, public officials, community members and organizations gathered today at the State House to mark Hispanic Heritage Month with a discussion about new research and best practices for reaching and enrolling the Commonwealth's uninsured Hispanic population. BOSTON – “We believe that consumers have to be at the center of the conversation when it comes to cost and quality of health care. The Boston Globe agrees: "Medical privacy plan offers sensible remedy." Get all the latest news from Health Care For All! In order to follow federal rules, MassHealth will be contacting certain MassHealth members with disabilities for renewals to make sure they still qualify for MassHealth. You may need to submit a new application to kep your health coverage. Get the details here. 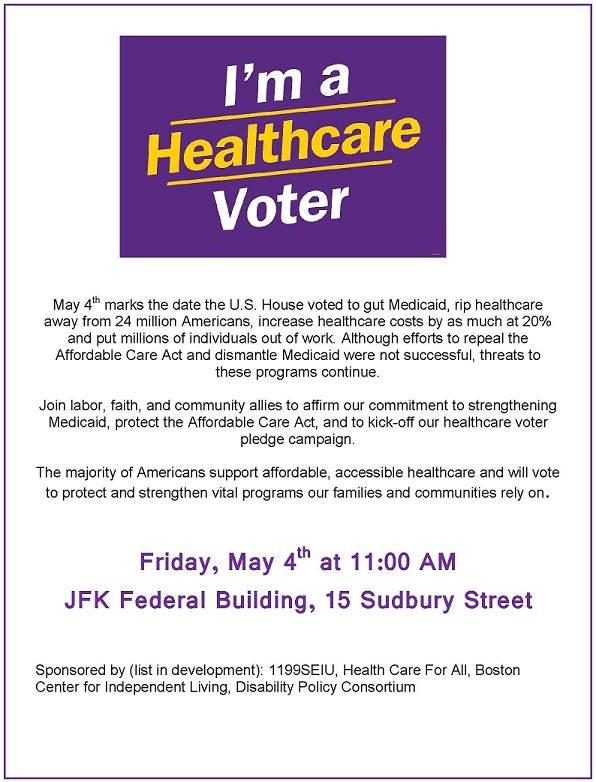 On Tuesday, May 19th, from 4:00 pm - 6:00 pm, Health Care For All will convene advocates and consumers at the State House to conduct legislative visits. We'll be urging Senate members to fund FULL restoration of MassHealth dental benefits. BOSTON - Statement from Health Care For All's Executive Director Amy Whitcomb Slemmer regarding the FY 2016 Senate Budget Proposal. BOSTON - Health Care For All (HCFA) inaugurated its 30th anniversary campaign by celebrating the progress made in health care access and quality in Massachusetts and by looking towards the work yet to be done to ensure that the health care system works for all. THANK YOU to all who joined us for our 30th anniversary celebration! *See For The People 2015 event photos here. *Watch the night's "Living Proof" presentation here.